Who says socialists are no fun? Socialist Worker invites you to a revolutionary rave-up! come as a punk, a goth, a 60s radical, a Bolshevik or an anarchist with a little round bomb! Weimar Germany anyone? Sleeping and parking provided so get as decadently drunk as you like! First Socialists invoked Christ to be a socialist hero. Now Santa? what are the ACT heros offering for Xmas kicks? What about Santa "oppressing" his elf workers? I don't see Commies voicing their concern about elves. Workers of the World unite for a workers' North Pole! End oppression by Santa and Mrs Claus! For an assembly made of Elven Soviets! Presents for all! 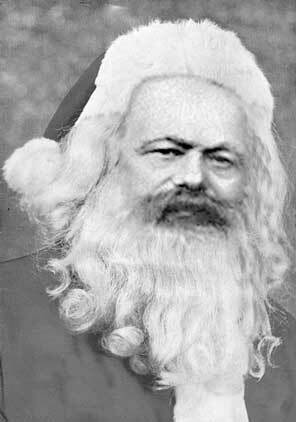 And yet cameron doesn't seem to denounce the Leftist Indymedia for endorsing Santa. Strange. Anyone can post articles on Indymedia. It wasn't the indymedia crew who decided to have a photo of Santa Marx there.